According to press release the simple installation ceremony in this regard was held and attended by selected gathering consisting of CEO, Engineering Development Board (EDB), Aitzaz A. Niazi, other senior officials of the Board, team of private TV Channel and management of AGECO Firm, says a press release received from EDB here today. AGECO has earlier installed successfully first wind energy turbine at F-7 crossing for generating energy by flow of traffic and supply it to traffic signals. The landmark achievement of AGECO was appreciated by CEO, EDB. He pleaded to the government to grant special concessions to pioneer of the wind energy projects in the country. The second wind turbine will generate 2 kw energy and its life is 20 years. Therefore, it is financially viable as it covers its cost in first year of operation. The firm planned to generate enough wind energy for supply of electricity to street lights and traffic signals of the Capital. EDB has taken up their case with the CDA Chairman for meeting their demand of enough suitable sites. 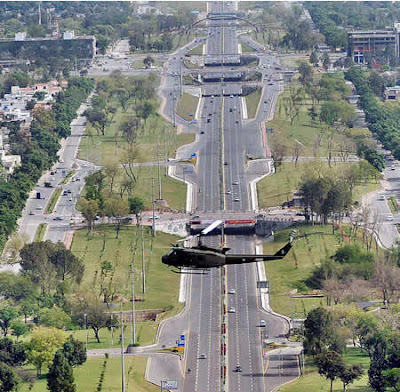 The Firm has also a plan to cover Lahore Rawalpindi motorway for similar projects. A wind energy vertical turbine has been designed by the AGECO Firm which operates at availability of wind in range of 2.1 meters to 7 meters per second against the maximum required range of 3.5 meters per second to generate 1.5 to 2 kw of energy in 24 hours. The locally designed wind energy turbine will cost Rs. 200,000 per kw as compared to imported turbine costing Rs. 1 million per kw.